Dodge debuted the new 392 cubic inch Hemi in the 2011 Dodge Challenger at the LA Auto Show, followed by the reveal yesterday of the Charger SRT8 at the Chicago Auto Show and if internet rumors prove to be true, the 2012 Jeep Grand Cherokee SRT8 could make its debut at the 2011 New York Auto Show. There have been images of an obviously-modified 2011 Jeep Grand Cherokee running hot laps around the world – including time on Germany’s famous Nürburgring – so we have known for some time that there would be another high performance SRT Jeep but now we have an idea as to what to expect. 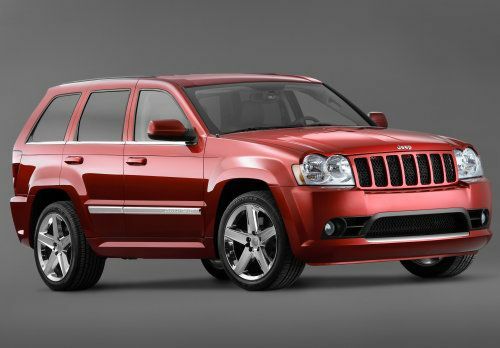 According to Jalopnik (via W2KJeeps.com), The 2012 Jeep Grand Cherokee will make its world debut on April 20th at the New York Auto Show and it will share many of the features of the 2011 Dodge Charger SRT8 that debuted yesterday in the Windy City. First of all (and possibly most important), the 2012 Jeep Grand Cherokee SRT8 is powered by the new 6.4L, 392 cubic inch Hemi. This engine was first found in the 2011 Challenger SRT8 with 470 horsepower (which has been proven to be lower than the actual output) and in the 2011 Charger SRT8, the 392 Hemi makes 465 horsepower according to yesterday’s debut of the high performance sedan. When the Grand Cherokee SRT8 makes its debut, it will likely feature between 460 and 470 horsepower with a torque figure in the same numeric range – although in fine SUV fashion, perhaps the folks at SRT will squeeze a little more torque out of the Hemi for this application. In any case, the 392 cubic inch powered Hemi will be the quickest SUV in all the land. The power of the new 2012 Jeep Grand Cherokee SRT8 will be sent through a 5-speed automatic transmission featuring manual shift control via the steering wheel mounted paddle shifters to all four wheels via Jeep’s advanced all wheel drive system. Like the 2011 Charger SRT8, the 2012 Jeep SRT8 could feature an adaptive damping suspension system that could help the sporty ute protect the claim of being the best-handling SUV on the road. There start of the 2011 New York Auto Show is a little over 2 months away so it could be a long wait for the high performance Jeep lovers – unless more information becomes available before then. Since the images of this new SRT-Jeep surfaced, it has been suggested that the next Grand Cherokee SRT8 is designed to deal with the likes of the BMW M-Series SUVs so we can expect the new high performance Jeep to be a serious performer when it does show its face.